I got an email from my Mama tonight. Here is the offical account on the history of the name "Pecan Log". Uncle Bubba gets his 15 minutes of fame! I luv this kinda ole history of the little thangs of life. Wish't I'd know more of Eastman--but I do think I mentioned that I used to make it a point to dine at the New Perry Inn whenever we wuz nearby at dinner time. No place else I knowed of that a traveler could git herself some summer squash wif' unions or cabbage wif' bacon or a honest biscuit. Great back story, thank your Momma. 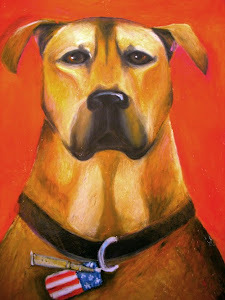 Love the dog painting. :-) Especially the dog tags. Ha! Go Chickory. I bought some pecan meal at Ellis bros to make pecan log balls. I made the trout for V when I got home and it was excellent. I didnt buy enough though i gave most of it away. the chickens got theres. I didnt see a stuckeys on the drive...where are they still? Mama Scout speaking: You occasionally see them around the interstate exits. There's one on I-75 south before Valdosta, but I forget the exit. Casey??? Stuckey's sold out to Pet Milk after Mr. Stuckey Sr. passed away, so there aren't as many as there used to be. At one time they were everywhere. I believe the plant in Eastman may still be open. I'll check it out with my HS friends there.